A poor fit for gaming, on paper, but a low-priced powerhouse in reality. A surprisingly great gaming performer, with vibrant colors and a quick, 144Hz screen. Struggling to keep up with the latest features for the best gaming monitors, such as 144Hz refresh rates, adaptive sync, curved panels, and low input lag modes? Then prepare to be even more baffled. HDR, or High Dynamic Range, is becoming more and more prevalent, and represent perhaps the most complex and confusing technology to yet hit the monitor market. 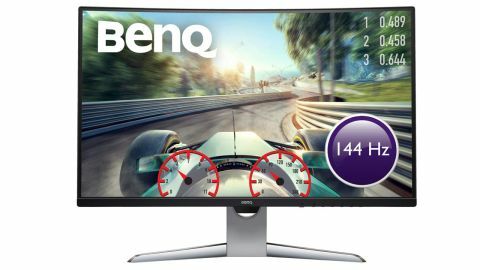 BenQ’s new gaming monitor combines all of the above, and more. In fact, it throws USB-C into the mix, along with a 32-inch diagonal LCD panel, and a gaming friendly quad-HD 2560x1440 native resolution. On paper, the EX3203R is killer. In practice? It’s more complicated. For starters, not all HDR displays are equal. In fact, good luck finding two that are entirely comparable. Not only are there multiple bodies setting standards, but even within a single standard-setting authority, you’ll typically find a tiered hierarchy of HDR certification. The EX3203R is a case in point. It’s one of the very first monitors to be awarded VESA’s Display HDR400 standard. So, there’s no doubt about its HDR credibility. Right? Not exactly. DisplayHDR 400 is VESA’s entry point into HDR. It only requires a peak brightness of 400cd/m 2. Many would argue the full impact of HDR only arrives at 1,000cd/m 2. DisplayHDR 400 also doesn’t dictate local dimming capability, and makes less stringent demands for color reproduction; BenQ says the EX3203R is good for 90 percent coverage of the DCI-P3 profile. So, DisplayHDR 400 is probably best viewed as HDR lite. The EX3203R has further on-paper shortcomings. The 32-inch panel uses VA tech. That’s great for contrast and eye-popping colors, so makes for a good fit with HDR. But VA is also the slowest of the major LCD panel technologies (the others being TN and IPS) when it comes to pixel response. Not so great for gaming, then. But if the EX3203R presents a complex theoretical proposition, how does it stack up in practice? Out of the box, it’s pretty impressive. The design is restrained for a monitor aimed at least partly at the gaming market, but with slim bezels on three sides and a sleek silver stand, the initial impression is of money well spent. Odds are, you’ll like the look of this from a gaming perspective, too. The colors are seriously punchy, and while 400cd/m 2 may be no great shakes by HDR standards, it’s more than bright enough by conventional metrics. Likewise, the EX3203R’s panel is rated at 3,000:1 for static contrast capability, and it looks every bit as good as that. The VA panel’s relatively subtle gentle curve also makes for a nicely immersive experience, without going to the polarizing extremes of more dramatically curved monitors. It’s worth noting that HDR remains problematical in terms of everything from ensuring it’s enabled to the mixed results you get when it is. Enabling HDR globally in Windows, for instance, makes the desktop look very dull. And as a general purpose monitor, the EX3203R’s GPU friendly 2560x1440 native resolution results in fairly fat and ugly pixels on the desktop. This is no high-DPI display. The VA panel also prevents the EX3203R from being at the cutting edge in terms of pixel response performance. However, inverse ghosting is not a major issue, and the 144Hz refresh delivers a fantastically smooth experience, provided you have a powerful and pricey graphics card. The EX3203R is not entirely free from flaws, and it’s not great all around, but it is a pretty compelling gaming companion all the same.